A Short History Of The Mysterious Disappearing Neutrinos : 13.7: Cosmos And Culture Incompleteness is the lifeblood of science. We don't know where the massive neutrinos will lead us, but it's fair to expect that the road ahead will have quite a few surprises, says Marcelo Gleiser. 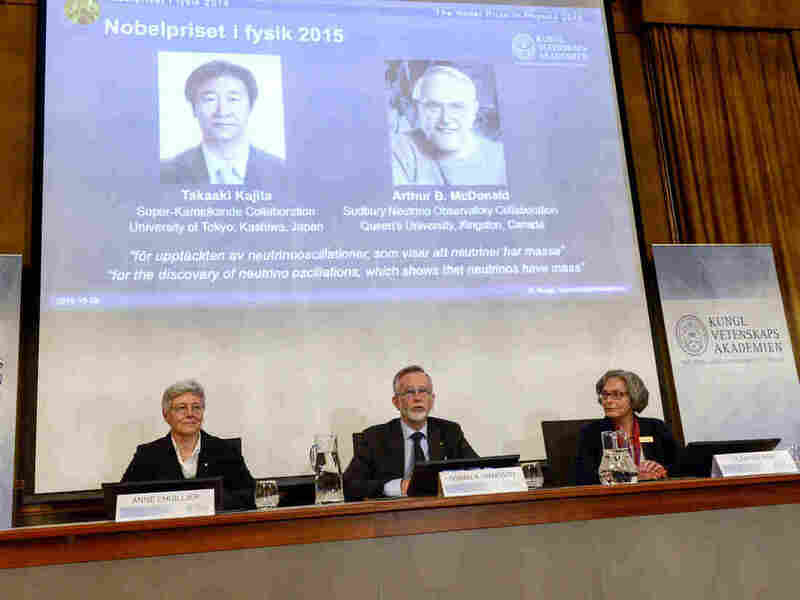 Professors Anne L'Huillier, left, Goran K. Hansson and Olga Botner, right, announce the winners of the 2015 Nobel Prize in Physics, in Stockholm, on Oct. 6. We learned Tuesday that Takaaki Kajita, from the Super-Kamiokande Collaboration in Japan, and Arthur McDonald, from the Sudbury Neutrino Observatory Collaboration in Canada (SNO), won the 2015 Nobel Prize in physics for helping to solve a long-standing mystery in physics: the disappearing neutrinos. In 1962, a group of physicists from Columbia University discovered another kind of neutrino, associated with processes involving the particle muon, a heavier cousin of the electron. The new neutrino became known as the muon neutrino. Completing the picture, in 1975 another relative of the electron was discovered at the Stanford Linear Accelerator, the tau lepton. With a mass about 3,500 times that of an electron, it was immediately conjectured that the tau would also have its own neutrino, the tau neutrino, just as the electron and muon do. The confirmation came in 2000 by the DONUT collaboration.